On July 11, 2006, Sony Electronics announced an extremely small thumb drive called the Micro Vault Tiny. The Micro Vault Tiny, which is only a half-inch wide and an inch long, will be offered in capacities of up to 4GB. The drives are “color-coded” by capacity: 256MB (orange), 512MB (violet), 1GB (blue), 2GB (green) and 4GB (purple). Sony has also pre-installed compression software called Virtual Expander, which “expands” the capacity of the drive by compressing and decompressing files. The Micro Vault Tiny is now shipping in sizes 256MB to 2GB; however the 4GB model will not be available until later this year. No specific price for any model has been set yet, but suggested retail is between $29.99 and $199.99 depending on capacity. Although these drives look fashionable, are extremely small, and are a brand-name product, they are way too over priced for the practical consumer. 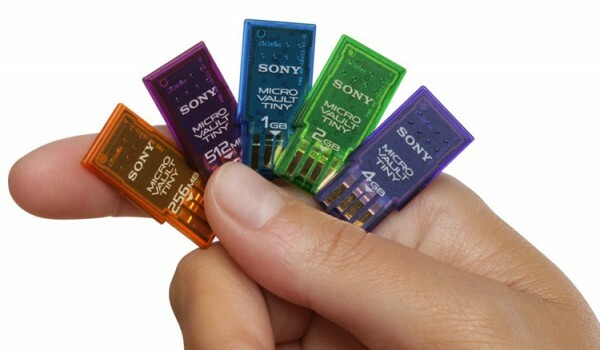 For example a no-name bulky 2GB USB 2.0 thumb drive, which may actually be more durable, will probably cost less than half of what Sony is charging. very cool looking but you’re right about the cost. hopefully they’ll come down. Or you could just get a cheaper brand that’s been around awhile and has pretty much exactly the same package.